After a long hard season, it went down to the wire in this match but Skerries ended up just short to maintain their position in Division 2A next season. Skerries turned in an encouraging performance against a Greystones side who were looking to regain the heights of old. The afternoon was bright and sunny which set it up for a ding dong battle between the teams and did not disappoint. It was a must win game for Skerries but like most games this season, Skerries were forced to make changes. Billy Mulcahy moving to full back, Ciaran Frawley after his 2 solid performances for Ireland U-19’s returning to No 10, Eoghan Carron back at scrum half with Colin Doyle & Paul Devitt on the wings. From the off, Skerries started the brighter of both teams and took the game to Greystones. Good pressure and ball retention from the forwards allowed the Skerries backs spread the ball through the hands and Kevin McGrath went over the line after eight minutes. Ciaran Frawley missed the difficult conversion but Skerries had the start they wanted. Skerries continued the good start and back on the offensive. After ten minutes, Skerries were awarded a penalty and Frawley duly converted to give Skerries a deserved 8-0 lead after 10 minutes. Greystones worked hard to get a foothold in the game and after good work by their forwards to dent holes in the Skerries defence, Simon Malone went over in the corner. The conversion was missed leaving the score 8-5 after 15 minutes. Within five minutes Greystones were level with a penalty from their impressive No 10 Killian Marmion. For the next 20 minutes, Skerries were starved of possession by Greystones. On the last play before half time, Greystones scored a crucial try in the corner after several phases by Dan Mannion and was converted by Marmion leaving the half time score 8-15 to Greystones. Time for the teams to take stock of what was needed for the second half. Similar to the first half, Skerries started the brighter and were making headway into the Greystones 22. 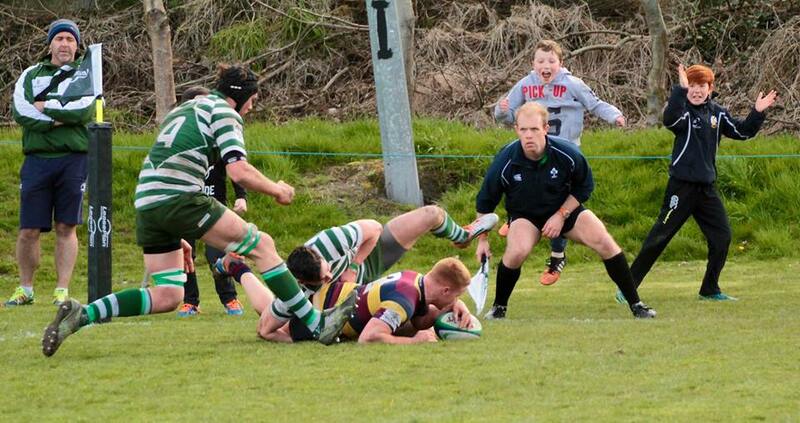 From a resulting ruck, the ball became loose and a fly hack down the pitch by the Greystones scrum half Jason Curran. The ball bounced perfectly into Geoghegan’s hand who sprinted to the line for Greystones third try. Marmion duly converted to make the score 8-22 and a mountain to climb for Skerries. To Skerries credit, they plugged away and with some great forward play from AJ Skerlock, supported by Ross McAuley and Thomas O’Hare, Skerries made inroads into Greystones 22 and got rewarded with a second try from Kevin McGrath. The conversion was missed leaving the score 13-22 to Greystones. Running repairs were required with Milo McCarthy coming in for Kev McGrath and Ross Hailligan coming in for Joe Glennon temporarily. Skerries continued to take the fight to Greystones and were awarded with another try after great work by backs & forwards. Chris Tonge went over and was duly converted by Ciaran Frawley leaving the score 20-22 with 20 minutes remaining. Skerries continued to apply pressure to Greystones and were awarded a penalty at a ruck. Frawley converted the penalty to edge Skerries in front 23-22. Kevin McGrath rejoined the game and Skerries looked for a way passed the Greystones defence. With ten minutes to go Greystones got the crucial score. Having made inroad into the Skerries 22, No 10 Killian Marmion executed a perfect cross field kick to Jack Keating who plucked the ball from the grasp of Paul Devitt and crossed the line. The conversion was missed by Marmion but crucially Greystones nudged ahead by two scores. Ross Halligan was introduced back into the game along with Conor Ronayne. Skerries had to throw caution to the wind and continued to apply the pressure. Eoghan Carron made snips up the short side and linked up with Kevin McGrath to score his hat rick of tries. Ciaran Frawley converted from the sideline to leave the score 30-32 with five minutes remaining. Skerries tried to make the break that would edge them ahead in this pulsating game. The final play saw Skerries nearly cross in the corner but Greystones survived and take their place in the final against Sunday’s Well. The game was probably one of Skerries’s best performances with each player putting in great effort unfortunately just coming up short. Throughout the season, changes were forced upon the Management team which never allowed any great consistency. Having said that, the Team are very young with several U-19’s making their debuts but having lost some key players at the start of the season due to retirement & injury, the team lacked the experience in crucial areas. Skerries can be proud of the efforts they made over the course of the season. They will apply their trade in Division 2B next season. Thank you to the Skerries Team and Management from all the Skerries supporters for all the commitment and effort throughout the season and can look forward to meeting up with new teams and friends for next season. Skerries team 1 to 20…. Cormac Marrey Chris Tonge John Condron Joe Glennon AJ Sherlock Thomas O’Hare Eoin Matthews Ross McAuley(Capt.) Eoghan Carron Ciaran Frawley Paul Devitt Ross Dempsey Kevin McGrath Colin Doyle Billy Mulcahy Kieran Leonard Conor Ronayne Ross Halligan Evan Sherlock Milo McCarthy Mark Oliver.